Having sensitive skin may sound like a sentence for shaving. Indeed, it is pretty difficult to have a clean shave with irritable skin. However, there are tools that can help you resolve this problem. One kind of those tools is an electric shaver. And that’s what we are going to feature today. We’ve chosen 5 great electric shavers to showcase. Each of them has its own unique thing, so there’ll be plenty of options for you to choose from. 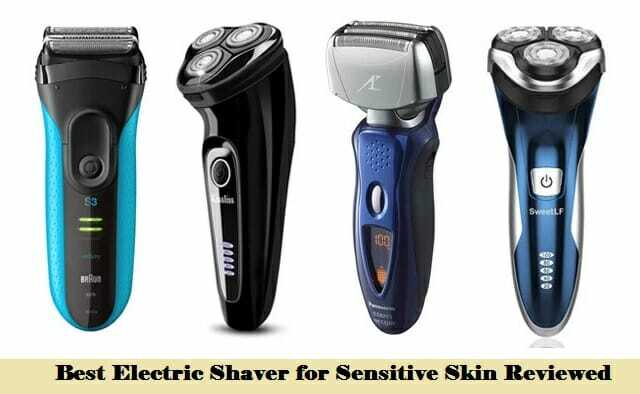 And to help you select the best electric shaver for sensitive skin from those 5 shavers, we’re going to provide you with a couple of handy tips. Time to see what those 5 electric shavers for sensitive skins have to offer! 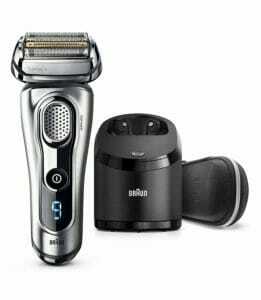 Marketed as the “best shaver” by Braun, the Series 9 9290cc is a go-to if you don’t care about the price. This thing is the most versatile, convenient, and powerful electric shaver on the list. What does make it such though? The first feature that should be noted is the shaving head equipped with 5 shaving elements – 4 cutting elements and 1 skin guard.Usually, only the most expensive electric shavers come with 5 shaving elements, and you won’t find more. Designed to work seamlessly, this 5-element shaving system should allow you to easily shave coarse and thick hair. Exposing your skin to the cutting elements for a shorter time,you run a lower risk of irritation. Among those 5 shaving elements are 2 specialized trimmers. These are designed to capture thick hair, allowing you to put less effort into shaving. The shaving head of this electric razor has also been made pretty flexible. Designed to catch hair in hard to reach places, its head floating shaving elements can move in 10 directions. Another notable feature is Braun’s Intelligent Sonic technology. With it, the shaver produces micro vibrations to additionally help with capturing hair. All in all, Series 9 9290cc is designed to provide you with a shave in just a couple of passes. And this is great when you are dealing with sensitive skin. Aside from shaving performance, Series 9 9290cc is great in terms of convenience as well. First of all, it is made waterproof, so it can be safely used in the shower. In addition, you can use it for dry, wet, foam, or gel shaving. The power management in this thing is also pretty interesting. 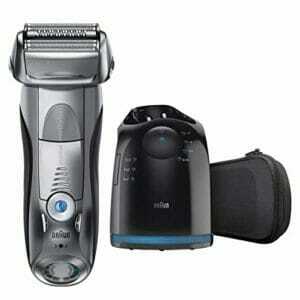 9290cc uses Braun’s AutoSense technology which adjusts the power of the motor depending on the area you are shaving. But possibly the most remarkable thing about this electric shaver is its 5-action clean & charge station. You just put the shaver in the station, and it cleans, charges, lubricates, and dries it for you.In a sense, 9290cc shaver allows you to focus on shaving, while maintenance and power adjustment are done for you. Some people will like that they have to do very little to use this shaver. But others may complain that it provides you with no control over the speed settings. 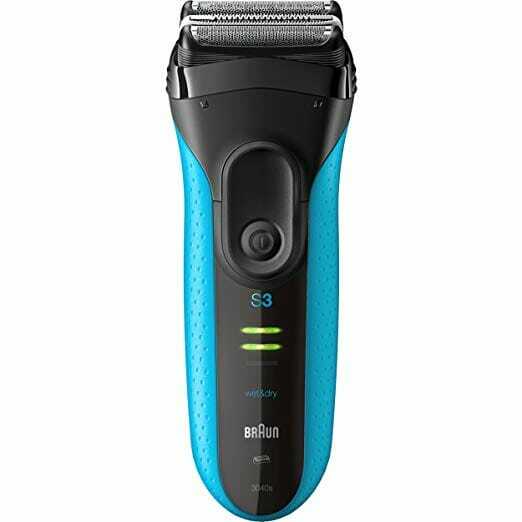 In the end,if you are willing to spend money to buy the very best – or one of the best – electric shaver on the market, then Braun Series 9 9290cc may be the right choice for you. Excellent in catching any hair. Multi-direction head and shaving elements. Auto adjusts the shaving power. The charging station cleans and charges the shaver for you. Braun Series 7 790cc shaver is a bit more modest than the Series 9 shaver we’ve just reviewed. But this may actually be much better for you. The main advantage of this shaver is that it is much cheaper. If you have a good budget but aren’t ready to spend nearly half a thousand dollars, then 790cc may be the better choice for you. In addition, if you really need speed adjustment in your shaver, then again, this one could be better for you. 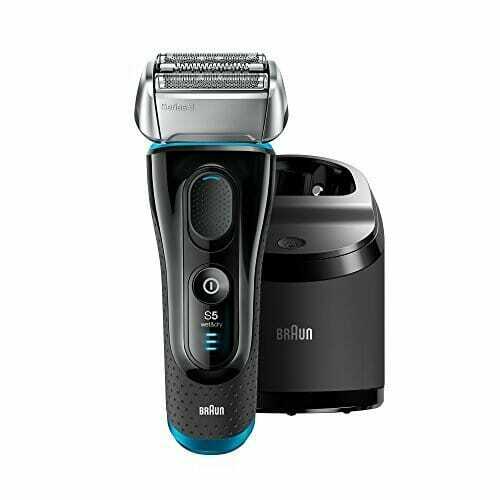 The 790cc shaver has 5 modes, allowing you to switch between turbo and sensitive settings. The auto-adjusting AutoSense technology is still present in this shaver, but its 5 settings should provide with much more control. As for the other features, Series 7 790cc electric shaver is very similar to its elder brother 9290cc. But it’s a bit more modest. First, this shaver has 4 shaving elements – 3 cutting elements and 1 skin guard – while the 9290cc had 5. Besides, the shaving head and elements of 790cc can float in 8 directions (9290cc could go in 10 directions). So in terms of cutting capacity and flexibility, 790cc shaver falls a bit behind its elder brother. This shaver has the Intelligent Sonic technology with its micro vibrations, so you could still expect a good shave from this thing. Just not as good as from the 9 Series shaver. When it comes to convenience, 790cc is pretty close to 9290cc shaver. Most importantly, it comes with a bit simpler charging station that performs the essential cleaning for you. However, the one major downside of this shaver is that it hasn’t been designed for wet or gel shaving. Braun writes that this shaver is waterproof, but their chart shows that it isn’t designed for foam, wet, or gel shaving. You’ll need to keep this in mind. Catches facial hair pretty efficiently. 5 speed settings and auto power adjustment. The charging station cleans and charges the shaver. Not suitable for wet shaving. Braun Series 5 5190ccfurther simplifies the features that the 7 and 9 series shavers had. However, 5190cc still is a pretty remarkable electric shaver. Let’s begin with the things that differ in it from the previous two models. First of all, it has got a 3-element shaving head, so it won’t be able to hand as coarse and thick hair. The second difference is that this shaver doesn’t have the Intelligent Sonic technology, so it may be less effective in catching hair in hard to reach places. Unlike the 7 Series 790cc shaver, 5190cc can be used for foam, gel, and wet shaving, which is a mandatory thing for amid-end shaver. In addition, 5190cc – like 9290cc – doesn’t have speed modes. Instead, it again relies on the auto-adjusting AutoSensing motor. The charging station in this model is a bit simpler as well. It still cleans, charges, and dries the shaver, but it has got a simpler 3-way action. In the end, 5190cc is a great shaver, albeit it may be less convenient than the 7 and 9 Series shavers we’ve reviewed. With this shaver, you’ll need to do more passes, and it may be less able to shave off thick hair. Still, it’s a great shaver for the price. Comes with an auto clean & charge station. 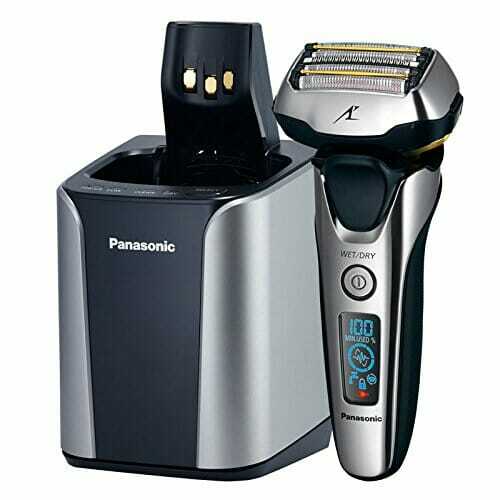 Panasonic ES-LV9N0s electric shaver is positioned somewhere in between Braun 9 Series 9290ccand 7 Series 790cc shavers in terms of both price and performance.There are many similarities between this and 9290cc shaver, but the Panasonic shaver has somewhat less shaving capacity. Like 9290cc, ES-LV9N0s is equipped with a 5-element shaving head, so it is pretty good at shaving thick and dense hair. In addition, ES-LV9N0s produces subtle vibrations to lift lying hair to allow the shaving head to shave them off. However, the one thing that limits ES-LV9N0s’s performance when compared to the 9290cc shaver is its shaving head. The thing is that in 9290cc, both the head and its shaving elements can move to adjust to your face. In ES-LV9N0s, only the head pivots. As a result, ES-LV9N0s delivers a bit lacking results when compared to 9290cc. But at the price difference, that’s what you would expect from this shaver. ES-LV9N0s still remains a good choice for the money. Like Braun 9 and 5 Series shavers, ES-LV9N0s adjusts its shaving power automatically, depending on how dense the facial hair is. There are no speed controls in this shaver, so some people may dislike it. Still, the inbuilt power adjustment should be adequate for most people out there. A thing that is definitely better in this shaver than in Braun models is that its LED display shows battery charge in percentages. Braun shavers use 3-5 bars to indicate the battery charge, so they are less precise. In addition, Panasonic uses more metal in their shaver than Braun does in their models. ES-LV9N0s thereby has a more premium feel to it, which may be important for some people. In the end, Panasonic ES-LV9N0s is a convenient and powerful shaver. For the price difference between ES-LV9N0s and 9290cc, the minor downsides of this model don’t seem that big. The shaving head auto-adjusts itself. Comes with a cleaning and charging station. The cleaning head isn’t as flexible as in Braun shavers. And the last model on our reviews is Braun Series 3 ProSkin 3040s. If you are looking for an inexpensive model, then this one may be the best electric shaver for sensitive skin out there for you. Needless to say, 3040s is a much simpler model. And it won’t be as good in shaving as its pricier counterparts. It is similar to the 5190cc shaver, with the difference that the 5 Series shaver is more powerful. 3040s again has 3 shaving elements, which makes it similar to 5190cc in terms of shaving capacity. However, things are different in this shaver in terms of flexibility. In 5190cc, both the shaving head and shaving elements adjust to the shape of the face. In 3040s, only the shaving elements do it, while the head itself remains stationary. Thereby, reaching hard to access areas on the face may be a bit more difficult with 3040s. What is also different in 3040s is that its motor doesn’t have automatic power adjustment. This thing always operates at full speed, unlike all the other shavers we examined. With that being said, 3040s can still be used for both wet or dry shaving, which we think any shaver needs to be capable of. 3040s also doesn’t come with a clean & charge station, so you’ll need to do all the maintenance yourself. On the other hand,the absence of a cleaning & charging station is one of the factors that makes this shaver much cheaper than the others. What you should also keep in mind is that 3040s runs on NiMH batteries. They have about the same runtime as the Li-Ion batteries in other shavers did. However, NiMH batteries are susceptible to voltage depression due to long-term overcharging. This effect causes faster battery discharging. Now, this effect is temporary and can be reversed. But it also means that you’ll need to prevent overcharging with 3040s. Any batteries suffer from overcharging, but Li-Ion batteries don’t suffer from voltage discharge. In the end, 3040s is an excellent choice if you have a tight budget. In spite of its limits of performance, it may still be the best electric shaver for sensitive skin for you on the market. Its NiMH batteries are susceptible to voltage depression. What to look for in a shaver for sensitive skin? Now that we know what each of the 5 shavers reviewed has to offer, it’s time for you to find out how to pick the best one from them. There’s only so much information you can find online because everyone will react to this or that shaver differently. We’ll try to provide you with as much info as possible so you can go from there and make the right choice. So what are the things that you should be looking for in an electric shaver for sensitive skin? One of the most important things to look for in an electric shaver is a pivoting shaving head or/and blades. They can make your life much easier and allow you not to worry about skin irritation. If an electric shaver has pivoting shaving elements, it will be much easier for you to shave your facial hair.The flexible construction of the shaver will be able to reach hard to access areas easier. Ultimately, this would allow you to do fewer passes. If you shave your chin for 30 minutes with a bad shaver, then you’ll probably irritate your skin. Thereby, your main task is to get an electric shaver that allows you to do as few passes as possible. And a pivoting shaving head is one way of achieving this. Pivoting head AND shaving elements (Braun 9290cc, 790cc, 5190cc). Pivoting shaving elements (Braun 3040s). Shavers that both have a pivoting head and shaving elements will be the most convenient and flexible in most cases.Their shaving elements can be positioned in a variety of ways, allowing you to shave very conveniently and quickly. Shavers that have either a pivoting head or pivoting shaving elements are also good, but they may not be convenient enough for some people. And as for models with no pivot, you should just avoid them. It will be difficult to shave hard to reach areas with them, and you’ll need to make more passes. In the end, you’ll probably get skin irritation. All the shavers on the list allow more or less freedom of movement, so they can all be good for you. Frequent shaving is one thing that may cause discomfort and skin irritation. Due to this, people seek to shave less frequently. And when you shave less often, your facial hair gets longer between shaving sessions. If this is exactly how you go about your skin sensitivity, then you will need to get a shaver that can deal with long hair easily.Otherwise, you’ll need to do more strokes, increasing the risk of irritation. As you could have seen from the reviews, some shavers allow you to manually adjust the shaver’s speed, while others do it automatically. Some shavers don’t have speed adjustment altogether, like Braun 3040s. You may want to get an electric shaver that has adjustable speed, but it isn’t mandatory. This will depend more on personal preference. Adjustable speed will make your life easier, but not everyone needs it. But you definitely don’t want to undershoot the speed. If you have coarse facial hair, then you’d want to have a quicker shaver. Otherwise, it will have a hard time shaving, putting you at an increased risk of irritation. And then, guess what? You get irritated skin. It isn’t quite the same with getting a too fast shaver. It most likely won’t cause any irritation if you have very soft facial hair. This is more a matter of money because faster shavers tend to cost more. And why pay more for speed which you don’t need? None of the electric shavers reviewed have a tendency for overheating, so you shouldn’t worry about temperatures too much with them. However, you shouldn’t neglect this factor when choosing an electric shaver for sensitive skin. Moreover, you will need to make sure that you don’t allow the shaver to get hot while using it. Shavers with badly designed blades that are too close to each other will tend to overheat. The friction between the blades will cause heat generation. The higher you go up the price, the less likely it will be that the shaver has badly designed blades. You should thereby get the most expensive electric shaver that you can afford. What may also cause overheating is bad lubrication. This is entirely on you, so you should lubricate the blades of your shaver often. Besides, the longer the shaver runs, the hotter it will get. This is another reason why it is very important to get a shaver that will allow you to shave in minimum time. Using a shaving cream or wet shaving can be very beneficial for men with sensitive skin. If you know thatwet shaving is better for your skin, then you should definitely get a shaver that can be used for wet shaving. Many modern electric razors can shave both dry and wet, but you should check it before choosing a shaver. Some shavers – even the higher-end ones, as Braun 790cc demonstrated – don’t have wet shaving capacity, so make sure to confirm that your desired shaver has it. Some kind of a refund guarantee is a must when you are dealing with skin-care products.It is nearly impossible to know how your skin will react to an electric shaver, so it is good to have backup plans. If a shaver is covered by a money-back guarantee, you’ll be able to return it in case it doesn’t work well for you. And then, you’ll be able to spend your money on something better. Can these shavers be used for shaving the head? They can be used for that, but make sure that your hair isn’t very long before shaving. What kind of refilling do you need to do with Braun’s clean & charge stations? Braun clean & charge stations use proprietary Braun refills, so you’ll need to buy them. You could get them from Braun’s website or online retailers like Amazon or others. Do electric shavers shave close? More or less, but you probably won’t be able to get as clean of a shave as with a regular razor. The pricier models on our list should get pretty close to regular razors though. Let’s be honest, finding the absolute best electric shaver for sensitive skin isn’t an easy task. Everyone will have unique needs and skin conditions, so not every guideline will work for you. The more experienced you get with shaving, the more you find out about what’s best for your skin.And if you’ve used quite a few electric shavers, then you should be able to approximately assess how each of the reviewed shavers will work for you. However, with our guidelines, you should be able to find what you are looking for. Most importantly, remember that the manufacturer needs to have a refund policy so you can get your money back if you don’t like your shaver!